Like any good secret laboratory, Zeni Kinetic is located in a nondescript building in downtown Salt Lake City that conceals the futuristic technology hidden within. Inside, company principal Nicco Macintyre sounds like a parent boasting about an honor student as he describes the technology his company uses to design supplies for 3-D printers. Nearby, a 3-D printer constructs a vase while making a noise that sounds like a more frantic, electronic version of Wonka’s Everlasting Gobstopper machine from the 1971 Willy Wonka & the Chocolate Factory film. “It’s very hypnotizing,” Macintyre says. While the process itself is mesmerizing, it’s the potential of this new technology that’s really fired up Macintyre and other 3-D printing believers like Jerry Ropelato, CEO of WhiteClouds, a 3-D printing company located in Ogden. And these local startups aren’t just cashing in on the ground floor of this technology, but are actually seeking to propel the technology into the hands of average users. WhiteClouds currently focuses on educating consumers on how to use 3-D printers, while Zeni Kinetic has hopes to donate or offer 3-D printing supplies at a discount to Utah schools. The 3-D printing technology itself isn’t new, having been known for several decades as “rapid-prototyping.” In recent years, though, the technology has advanced to the point that people with a certain amount of technical skill can order kits to create their own 3-D printers at home. A 3-D printer kit can be purchased online for as cheap as $500, while professional commercial-grade printers could set you back $25,000 to $50,000. Macintyre says 3-D printers will be considered as revolutionary as the personal computer once they become accessible and user-friendly enough for the general public. The demand is there, he says, because of the nearly limitless possibilities for what can be printed—from plastic and precious metals to chocolate and ceramic. Macintyre has printed equipment for his business for roughly $10 that otherwise would have cost hundreds of dollars to have custom-built in a machine shop. 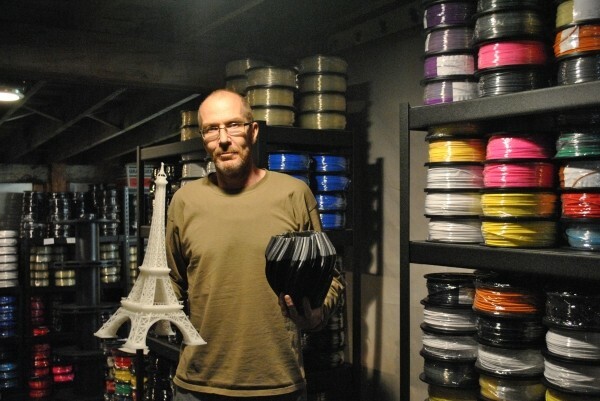 The Zeni Kinetic office is well-stocked with 3-D printed vases, jewelry boxes, Yoda heads and a foot-tall replica of the Eiffel Tower, all test prints based on the company’s special filament, a plastic that serves as the “ink” for the 3-D printer. The company is working on marketing a $600 printer in the fall, but the filament—applied in layers thin as a human hair—is the company’s premier product. It’s also something they want to give for free or at discount to local schools that are looking to use 3-D printers as teaching tools. Darrell Andelin, technology & engineering specialist for the Utah State Office of Education, says that free or discount filament could be a great benefit to Utah’s educational programs, where, he says, approximately 30 schools currently have 3-D printers in their engineering and design classes. Andelin says that with the recent developments cutting the costs of printers, he expects that number could double in the next year, as 3-D printers could serve a crucial role helping students in high school engineering programs see an output from their designs. Ropelato’s WhiteClouds has the wider goal of “bringing 3-D printing to the masses,” offering videos and tutorials to help users understand the technology as well upload their own design and have the company print it out in 3-D, or choose from a catalog of 7,300 designs. The company started less than a year ago, in April 2013, and Ropelato says the first six months were devoted to research and development, which the company then turned into free educational materials for other people interested in 3-D printing. The company also offers the services of its design team to help print customer ideas from scratch. “3-D printing is really an entrepreneur’s dream; you can go from a napkin-sketch idea to a physical object within about 24 hours,” Ropelato says. For all those looking to print the future in 3-D, the key to the technology is helping others to understand it. Zeni Kinetic’s Macintyre believes that if children embrace this technology today, they can use it to solve the problems of tomorrow. He cites as an example Philo Farnsworth, the famed inventor and Utahn who came up with the key idea behind the invention of the television when he was only 13.